Presentation and Packaging Tips for Success | Flottman Company, Inc.
Make your products standout among rivals and competitors at upcoming craft fairs with professional and pretty packaging ideas. Also, the way that you present your company at craft shows and fairs can have an impact on overall success. Visit us online to find what you need to enhance the aesthetics of your handcrafted or homemade items. A simple way to package and present the items that you make is with adhesive labels. Since these will stick to multiple surfaces, like paper or plastic, you can use these in a variety of ways for a wide-range of products. Be sure that you don’t fall prey to common labeling mistakes like ingredient and weight inaccuracy or forgetting to add your contact information. Cute bags or boxes are another way to package your items, which also works when you need to ship something to a buyer away. Talk to Flottman Company about buying windowed-boxes or craft paper to create some clever packaging suggestions that will pique curiosities and grab attention at a fair or show. Remember to tell us to customize these packaging materials with your company logo to foster brand-name familiarity among your consumer audience. Business cards give the impression of professionalism and ensure that you provide potential buyers with the information that they need to contact you. While you could make your own business cards at home with a computer and printer, these are an inexpensive item to purchase from us. If you need more space than a business card to announce an upcoming event or highlight a particular product, ask aboutprinted postcards instead. Do you have a sign for your table or booth? Invest in a multipurpose vinyl banner for your upcoming show, and to use later on as signage for other events, like pop-up shops or farmers’ markets. Vinyl banners are inexpensive, weather-resilient, and widely available from Flottman; this is a powerful tool in making a favorable first impression among potential customers during your upcoming craft fair. Customers enjoy being appreciated and one way to demonstrate this gratitude is to offer promotional products to your loyal patrons. Choose from a wide variety of personalized promotional items, from combs to coats and cups to caps, to please and reward individuals that buy your merchandise. These are also great items to have on-hand for raffles, customer promotions, and referral rewards during your selling season. If you plan on selling your handcrafted items as a source of income, optimize your potential revenues with some simple yet effective marketing tips. These suggestions will help you expand your business and build a consumer base. Make sure that you are not selling too low; it is easy to lower prices but more difficult to explain price-hikes to your repeat customers. Talk to Flottman about making colored brochures that display all the products that you sell, in addition to your complete contact information. Arrange these at your table during the event for patrons to pickup and, hopefully, pass around later. 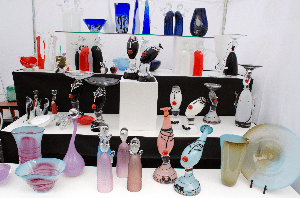 Make sure that your products – and your table – look their best during your upcoming craft fair. Reach out to Flottman professionals and their marketing specialists at FUSIONWRX for information, advice, and estimates to create a powerful presence and pleasing packaging for whatever you sell!